In Spalding Gray's performance of "Swimming to Cambodia," he recalls that the Cambodian Genocide has been referred to the "worst genocide in modern history," or "hell on earth." The atrocious killings of this genocide are depicted in the countless photos of bones and skulls, reflecting the two million that were killed or starved to death. The capability for humans to be so cruel to other humans brings into question true human nature-- Are we savage beings? In the Khmer Rouge regime, anyone could be killed for little or no reason. Anyone could be an enemy, and this cynical nature was passed down to the child soldiers. However, in First They Killed My Father, Loung barely manages to stay alive while maintaining her hate for the Khmer Rouge. She loses her mother, father, and two of her sisters, and witnesses death daily. "Hard and fast I stab [the dummy], each time envisioning not the body of a Youn but that of Pol Pot. Now it is all real. Now I no longer have to pretend to be an orphan" (163-164). In this new communistic society, intellectualism was viewed as the enemy. Any indication of education gave the Khmer Rouge license to kill. Their justification against education was their push to have a fully agrarian society, to cut ties with all advanced knowledge and material items. Also, the ignorant are easier to persuade and continue the awful regime, and exterminating the educated signifies less opposition. ...Or, perhaps, the lack there of regarding this genocide. This lack of media may be because the Khmer Rouge did not allow any journalists or foreigners in to Cambodia to capture the atrocities that were committed. The push for all journalists to leave and conceal the atrocities of the Khmer Rouge is reflected in the film "The Killing Fields." Secondly, the United States did seem to have a part in some of the factors that led to the genocide. 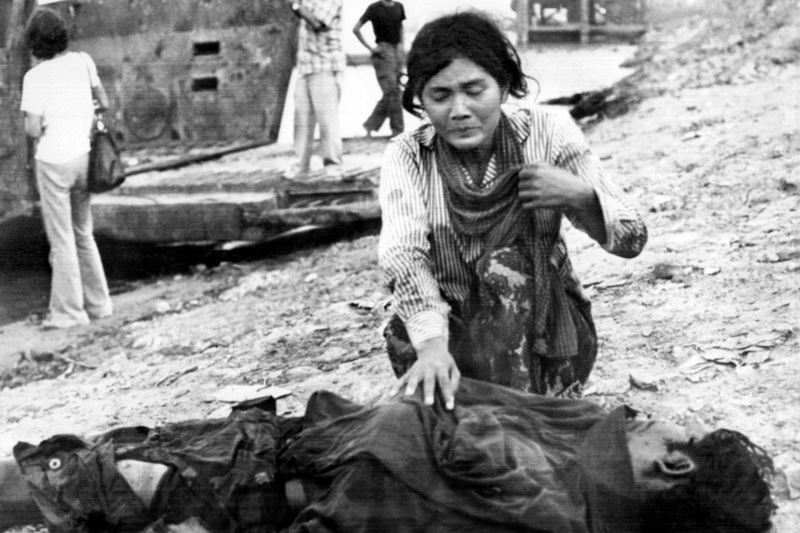 Their attempts to kill Vietnamese on Cambodian borders led to an uprising among the Cambodian people of their poor leadership. The communistic government became very appealing for the peasants and agrarians, which eventually spawned the Khmer Rouge with Pol Pot as their leader. Perhaps the United States press did not cover the genocide in order to conceal their own mistakes? Or maybe, after the failure of the Vietnam War, Americans did not wish to be involved in more foreign affairs. The lack of coverage can easily be reflected in "Swimming to Cambodia," in which Spalding Gray spends very little time discussing the actual conflict of the Cambodian Genocide. Instead, he discusses his desire to find simple pleasures in foreign countries, appearing vain by not discussing the mass amount of horrors that took place. He simply glosses over the facts of the Cambodian Genocide, spending more time talking about drugs and prostitutes than an event that killed over two million people. However, his lack of commentary on the conflict indicates this lack of coverage– not many knew the atrocities that took place. His self-obsession may also be a commentary on the United States regarding conflicts– that Americans only care about their role (such as his role in "The Killing Fields") in conflicts rather than the facts about the conflict themselves.